TravelnWrite: "It's About What You Leave Behind"
"It's About What You Leave Behind"
For us, travel is as much about people as it is places. As 2010 comes to a close we recall some of those incredible folks and the fascinating conversations that we 've had with them as they went about their day-to-day lives. Each encounter has enriched not only our travel experiences but our lives as well. . .
We were off to indulge in some of our favorite gyros at a place in Poros just around the corner from the Hotel Manessi. We were nearing the end of our stay on this special island only an hour by fast ferry from Athens. Time enough for one more gyro dinner before we left. 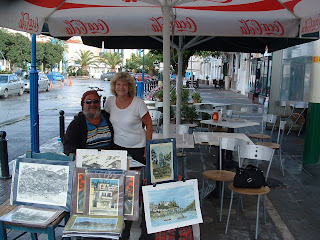 On this particular evening we had more than good food - we had an art display next to our sidewalk table. And even better, an opportunity to meet the artist who sat sketching, surrounded by his finished pieces. I was taken by one of his prints, a night scene of Poros, as it looked exactly as the city had the night before under a full moon. I purchased it for 20E and kicked myself for having left the camera in the room as it would have been great to take his photo. "Not to worry," he assured me, "if I am not dead, I will be here tomorrow." ﻿ The next day's early afternoon downpour had me fearing that Vasilas Poriotis may not have opened his portable gallery, but there he was in the late afternoon under one of the restaurant's sprawling umbrellas; sketching away, framed by his finished pieces. With photos taken we took him up on his suggestion to sit awhile and visit. (His fluent English he credits to the Greek school system and his one-time marriage to an English woman). As we sat at the edge of the busy harbor front road, Poriotis, described himself as a "low-art" self-taught artist whose finely detailed work features buildings and street scenes. We chatted about his work and his life, both of which focus predominately on this Greek island. "I am not focused on the end - I am not afraid of it when it comes. . .it is what you leave behind that matters," and with a sweeping gesture over his work, added, "and I have left something behind. "It is important to leave something behind." A Novel Experience: Savannah's "Taxi Writer"
Do Not Feed the Alligators!